Not too often, but often enough, young members of the military find themselves wanting to get out of the military before their commitment is over. It is not uncommon at all during boot camp or basic training to want to go home, as many young teenaged recruits miss their civilian life, family, and friends. Sometimes the person is disillusioned with what seemed like the perfect job when in high school. Perhaps their recruiter lied to them, or perhaps did not do enough research on their future job, where they would live, and how much free time they would have. At some point, the recruit decides during or after basic training, that they don't like the military and want out before their four-year enlistment has ended. Unfortunately, there is no one easy way to get out of the military before your service is complete. Once sworn in at basic training, getting discharged once you are on active duty before your active duty commitment is up is no easy task. Joining the military is not like accepting any other job. When you sign a contract, you take an oath, you are legally (and morally) obligated to complete the terms of the contract, even if you don't like it. While "quitting" isn't an option, there are some ways you can be discharged from active duty, but they are rarely voluntary. It's especially important to note that early separation or discharge from the military is different from military retirement and even disability or medical separations. A military discharge means that you are being released from your obligation to continue service in the armed forces and that you are relieved from any future military service obligations or recalls. Once again, these early discharges are rare. 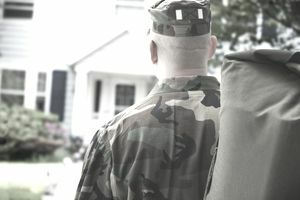 A breach of your enlistment contract can be terms for voluntary early separation from the military, but it is very rare. Some people mistakenly believe that discovering dishonesty on the part of their military recruiter represents a breach of contract and is grounds for seeking separation. While dishonesty can be an unfortunate consequence of the way the military recruiting system is set up, recruiter dishonesty is not inherently a breach of contract. Ultimately, if it's not written in your enlistment contract, it's not a promise and therefore can't be grounds for a breach of contract. It's that simple. That said, on rare occasions, there is an option for discharge from service due to a true breach of contract. Most of the time, it's related to a guaranteed job. To understand how this breach of contract can play out, it's important to understand what a "guarantee" means within the context of your enlistment contract. For example, a "guaranteed job" in your enlistment contract does not always mean you will get that job after basic training. There are many reasons you may not get the job your enlistment contract guarantees especially if it requires a difficult selection process and you failed to meet the standards—academic, physical, medical, or security clearance standards. In general, if you can't get the job due to something beyond your control (such as the service phased out the job, downsized the job, made a mistake and discovered that you don't qualify for the job, or you are denied a security clearance for reasons other than falsifying information), then you will be given the choice of applying for a discharge or choosing a new job. Most of the services impose a time limit on applying for a voluntary discharge due to this kind of breach of contract. Usually, you must request the discharge within 30 days of being notified that one of the guarantees in your enlistment contract cannot be fulfilled. In this case, the choice is yours. It should be noted, however, that while these situations have been known to happen, they do not happen often. And, if you fail to qualify for the guaranteed job due to a reason within your control (you fail in training, you get into trouble, or you are denied a security clearance, for instance), the choice is no longer yours. The military will decide whether to discharge you (essentially throw you out) or to retain you and retrain you for a job you qualify for—typically the needs of the military will drive the choices. In this case, it's the military's choice where you go. In the past, a female member of the military who became pregnant during active duty could request military separation and get it almost automatically. But today, women play a much larger role in the military than ever before, and the rules surrounding discharge for pregnancy have changed as a result. In short, pregnancy alone is no longer a reason for military discharge. While different branches of the military handle pregnancy differently, all are required to offer maternity leave. Except during times of war or national emergency, you can request a discharge if you are a "sole surviving son or daughter." The most important thing to note about this discharge opportunity is who qualifies as a sole surviving child. Being an only child, or the only child born to your parents, doesn't qualify you for this status. Neither does being the only child because of a civilian sibling death. It only applies to a sibling who dies in service of his/her country as a military member. While in most cases you cannot simply quit the military, the military services can certainly kick you out if you fail to measure up to their standards. Being released from military service by involuntary discharge is neither fast nor pleasant. In most cases, your commander must show "rehabilitative measures" have been taken before he or she can impose an involuntary discharge and that can mean Nonjudicial Punishment or Article 15, which can result in loss of stripes, loss of pay, restrictions, extra duties, and correctional custody before you are officially discharged. If you think you dislike the military before trying to get kicked out, try being a soldier who fails at everything and causes nothing but trouble for the chain of command. These are just some of the ways to get kicked out, but all will yield an "Other Than Honorable" or even "Dishonorable" discharge, which can have consequences for the rest of your life with future jobs and other freedoms. In addition to these early military discharges, some of the military services allow enlisted personnel to request early separation for release to the National Guard or Active Reserves. Other types of early separation are granted for reasons like service commitments, hardship, further education, government convenience, and conscientious objectors.